The Creators Project, a partnership blog between Intel and Vice, conducted an interview with netwars/out of CTRL executive producer Saskia Kress. In the interview, Kress introduced the various platforms the netwars/out of CTRL project will consist of – a TV documentary, interactive web doc, interactive graphic novel app, e- and audio book series. “We wanted to prove with real hackers how easy it is to hack into a control system of a very critical infrastructure. And it worked!”, Kress told The Creators Project. While the TV documentary will show the status quo, the interactive web doc will take the topic one step further. Users meet a salesman who will show them how they are personally affected by cyber warfare every day. “We just show you how vulnerable you are. That´s the intention of the project – to prove that everyone is affected, and…the whole idea of personalization and emotionalizing it”, Kress says. The graphic novel app takes things to another level – where users take part in a fictional story showing them a potential cyber warfare worst case scenario. 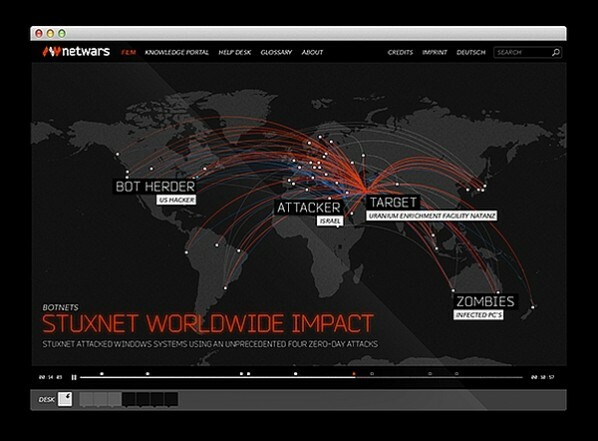 For more information about all our platforms, check out the netwars / out of CTRL project site.